These subtle but prized typographic conventions find themselves under threat from the wretched “hyphen-minus,” an interloper introduced to the dash’s delicate habitat in the late nineteenth century. Too crowded to accommodate the typewriter keyboard required a compromise; the jack-of-all-trades hyphen-minus was the result, and its privileged position at the fingertips of typists everywhere has led to it impersonating dashes and hyphens alike with alarming frequency. In print and online, the well-set dash is an endangered species (146). Keith Houston’s book Shady Characters is a sheer guilty pleasure of a read. I know people get very precious about their punctuation, but I am not one of them. I am far too flawed to get caught up judging others by their adherence or lack-thereof in regard to an elusive ideal of punctuation. Particularly as such a thing, of course, does not exists. Yes, we have meandering conventions (that differ by country). And, largely thanks to the printing press and the limitations of the keyboard, there is some agreement now-a-days, but as Houston’s romp through the history of punctuation attests, it has not always been thus. In the eighth century the first chinks of light appeared in the claustrophobic scripto continua that had dominated writing for a millenium. English and Irish priests, in an attempt to help reader decipher texts written in unfamiliar Latin, began to add spaces between words (13). The history of the pilcrow is a beautiful example of the metamorphose and efficiency of the nature of language. What started as a K to signify kaput, meaning head (of a section), in Latin is capitulum. The pilcrow, which some will recognize as that backwards P denoting paragraph, is really an elaborate C for capitulum, while the word itself, pilcrow, has its etymological roots in paragraph. As Houston describes it, the symbol become such a popular device in manuscripts that it effectually “committed typographical suicide” (16). In the production of manuscripts there were several distinct stages and persons whom performed the stages. 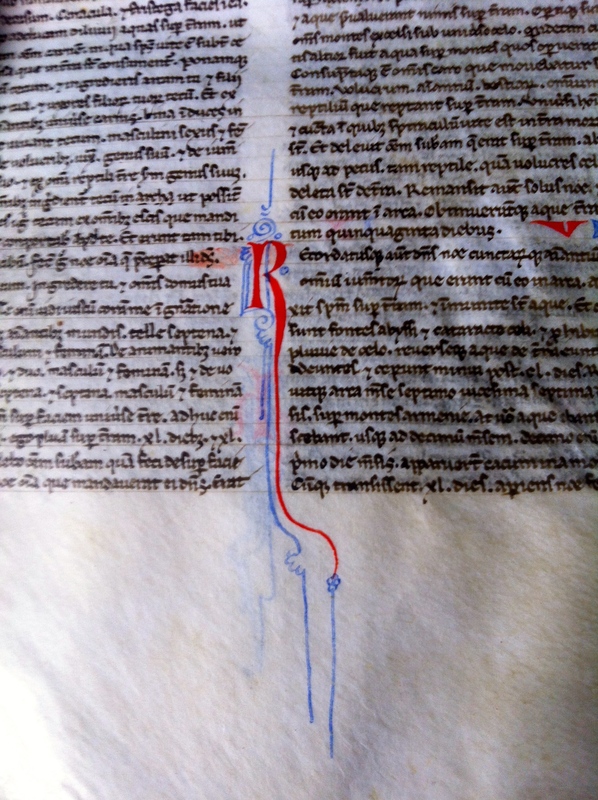 A scribe would write all of the words but would leave spaces for the rubricator (in red ink) to add the versals and other notations, such as the pilcrow. As the pilcrow increased in popularity the rubricators couldn’t keep up. They simply ran out of time and began to leave some of them blank. When printing took over there was an earnest attempt to mimic manuscripts, when confronted with an un-rubricated space, they simply left it blank too. And there you have the blank indentation which denotes, for all of us, a paragraph. The ampersand is another wonderful tale and its long lost brother, the Tironian et, equally so. We are inundated with text around the clock, a book such as Houston’s illuminates the long arm of our written history with all of its successes and failures (sarcasm punctuation anyone? Anyone at all? sigh. Apparently not). When one sees how capricious a history it is the hubris of the grammar snob is deflated just a bit. No good comes of static standardization after all, it’s unnatural. *title from p. 130: the undesirability of long words undermining the typesetter’s ability to justify text easily, hence the promiscuous use, in incunabula (early printed books) works, of hyphens.